"WOW!!! These are awesome and really reasonably priced. We have just bought a house, so will probably move in January, then we have to knock down the wall etc., but I think we will definitely be using you. The African Allure is just mind-blowing." What is a free-standing kitchen? What are the advantages of a free-standing kitchen? What does a Milestone Kitchen cost? Will someone from Milestone Kitchens come to my house and give us a quotation? How do I order a Milestone Kitchen? What kind of tops can I get for my kitchen? How can I seal my wooden tops? Can I get doors only? How do I install my Milestone Kitchen? What colours can I use for my kitchen? Please provide more details about the paint finishes. What does the inside of the units look like? What runners do you use? What hinges do you use? How do I fit my sink? 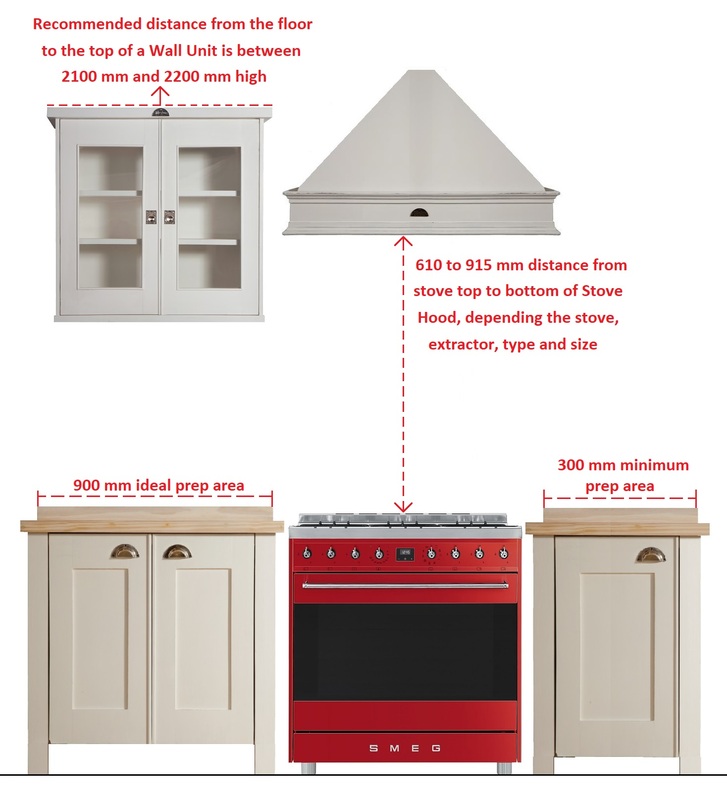 Can I fit my stove/oven/hob into any of the units? Will any of the units require additional work? Do I have to have Castor Wheels on my Swedish Style units? What can I do if my corner unit will not fit through my door? Should I put a skirting in my kitchen? 1. What is a free-standing kitchen? This is the way kitchens used to be, back in the day. A free-standing kitchen is when the kitchen units are not attached to each other or to the wall as they would be in a conventional kitchen. In conventional kitchens the kitchen is fitted permanently on to the wall. They cannot be moved. If you had to remove them from the wall, they would fall apart and you would be left with a whole lot of chipboard sheets, some doors and top. It would look something like this. When you buy a Milestone Kitchen you are buying kitchen furniture as stand-alone pieces. The units are self-standing, they do not need a wall to keep them together. The units do not need to be attached to the wall to stop them from falling apart. Although many of our kitchens take on the appearance of a permanently installed kitchen, there is always the possibility to rearrange the floor plan if you want to. Sink Units will require plumbing and Stove Units might need basic electrical work, but most are free to move as you wish. Wall units are obviously attached to the wall but they are attached to the wall in much the same way as a framed picture is. You could move this too if you feel like it. Free-standing kitchens are becoming popular with good reason. They offer greater flexibility and the freedom to change things when the mood takes you or necessity demands. It's even possible to fit castor wheels on most of our floor units for even easier repositioning. On a budget? A Milestone Kitchen can also be bought piece-by-piece, with additional units added in when cash flow allows. 2. What are the advantages of a free-standing kitchen? Adjustability: You are not forced to endure one look for the next 20 years. Your kitchen can change and grow with your family, home and budget. Modular purchases: You can buy one piece at a time and build on as your budget allows. Easy access: In the case of an emergency such as a leak, fire or electrical fault, it’s easy to get behind and underneath the units as they are not stuck to the walls. Hygiene: Free-standing kitchens can be moved for cleaning. Let's face it, sometimes a rat or a cockroach will get into your kitchen. In a permanently fitted kitchen these vermin make cosy little homes inside the cupboard linings. Not so with Milestone units - there’s nowhere for them to hide. Style match: You can choose units to closely suit the existing decor throughout the rest of your house. We can even match the colour if you have a paint code. Cost: Milestone Kitchens are only available directly from us, online, through our website. This saves on overhead costs and we are able to pass the savings on to you. Investment: If you move home you can take your kitchen (or at least pieces of it) with you. Remember to leave our web address in the empty kitchen. 3. What does a Milestone Kitchen cost? If you compare our units with other quality kitchens (we do not use melamine or chipboard), you will likely find that you would pay approximately half as much as you would for a fitted solid wood kitchen. We offer unbeatable value for money when it comes to solid wood kitchens. We challenge you to do the homework, get other quotes and compare. But remember to compare with SOLID WOOD kitchens and not your standard melamine and chip board ones. There is a D.I.Y. price advantage. Our kitchens fit perfectly between DIY Pine kitchens and costly professional installations. You design and plan your own kitchen so you save on built-in consultation fees. Our kitchens do not need to be installed so you save on built-in installation fees. If you are able to organise your own delivery, you can save on that too. We estimate this almost halves the cost of your new kitchen. Our prices are based on this system which has the advantage of working out cheaper than buying a fully fitted kitchen, but it also involves a little more work from you. You could of course hire a professional fitter to do the job, in which case the cost should still be a fraction of most kitchen suppliers, as the units are already built. Tight budget? With us you can buy one piece at a time and build on modularly as your budget allows. 4. What will delivery cost? The cost of delivery depends on where the units are to be delivered, how many units you have ordered and how big and heavy they are. We cannot tell you how much it will cost exactly until we know what you want to order and what the delivery address is. We can tell you that in most cases delivery ends up being around 8% of the total cost of your order. We are able to deliver to anywhere in Southern Africa, Africa or the entire world. 5. Will someone from Milestone Kitchens come to my house and give us a quotation? No, this is not our way. The idea with Milestone Kitchens is that you design your own kitchen. You can use our Kitchen Planner which you can download from our website to help you with this. We are happy to look at your kitchen plan if you send us a copy, but ultimately you need to decide on which units you would like to order. You can even work out your own quote by using our quotation sheet. Ask us for our quoting document. You can make an appointment to visit us at our Factory Outlet Shop in Johannesburg so we can chat about your kitchen with you and help you design it. We are inundated with people requesting this service so we charge you R650 for this consultation, but we deduct it off your order should you opt to proceed with a deposit. 6. How do I order a Milestone Kitchen? 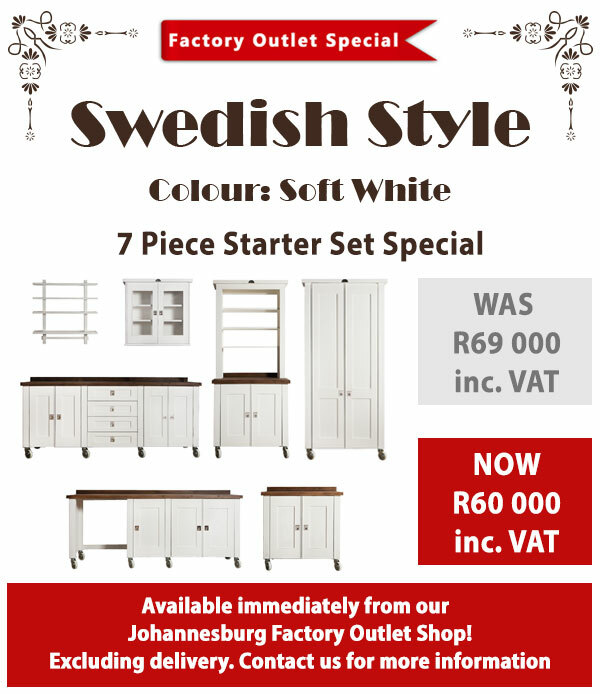 Choose the range you like best from three options; African Allure, French Flair or Swedish Style. Draw up a floor plan by using our online Kitchen Planner. Send us a list of the units you require and their dimensions. Or request our blank quotation sheet so that you can create your own quotation. Remember to include your choice of kitchen colour, top, base and handles. Send us measurements or sketches of custom-made units if required. At this stage we will send you a quotation based on the information you have given us. If you are happy with your quotation, pay a 50% deposit to secure your order on our production roster. Sign and return your quotation and our Terms and Condition document before we start production. Wait for us to notify you that your order is completed. This usually takes about 6 weeks. Pay the balance of your order when we send you an invoice, before we dispatch your units. Receive your units on-site and push them into place. Hang up any wall unit you have. Plug in the stove, fridge and connect the plumbing. Be happy and enjoy your new Milestone Kitchen. 7. How do I measure correctly? Milestone Units are not designed to fit perfectly together in one continuous line. Units are designed to be freestanding with gaps in-between them. However, some clients like to ‘cheat’ and like to make their Milestone Kitchen look like it is fitted. It is possible to order our units so that they fit flush next to each other without gaps between them and to fit one continuous top over the whole lot. If you should choose to do this please make sure you measure correctly. Here are some guidelines. The Cornice of the tall units protrude on either side of the unit. 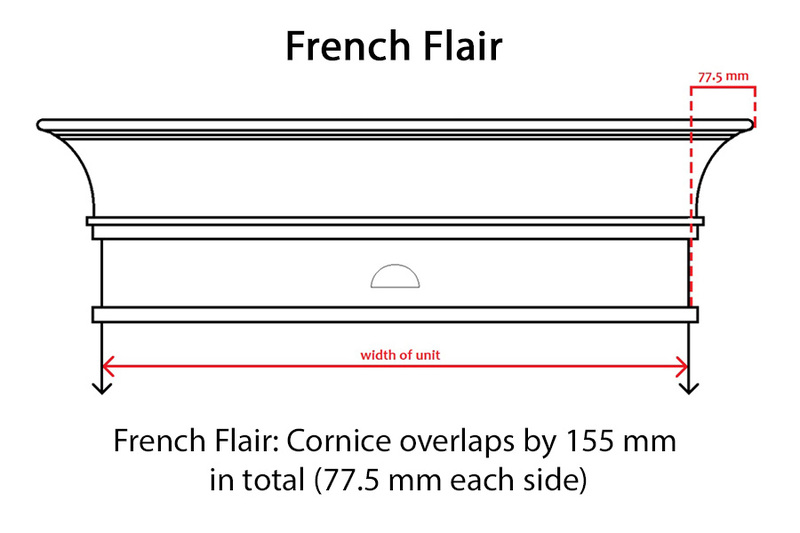 Each range has its own different cornice measurements. So two tall units standing side by side will have a gap between them, created by the cornice overhangs. If the unit is against a wall there will be a gap between the unit and the wall. The width of a floor unit is measured along the length of the top. The top overlaps on each side by 25mm. If you order a unit without a top, if will be 50mm less along the width of the unit. We do this so that if you put your own top on you will still have an overlap on each side. This is prettier than having the unit flush at each end. 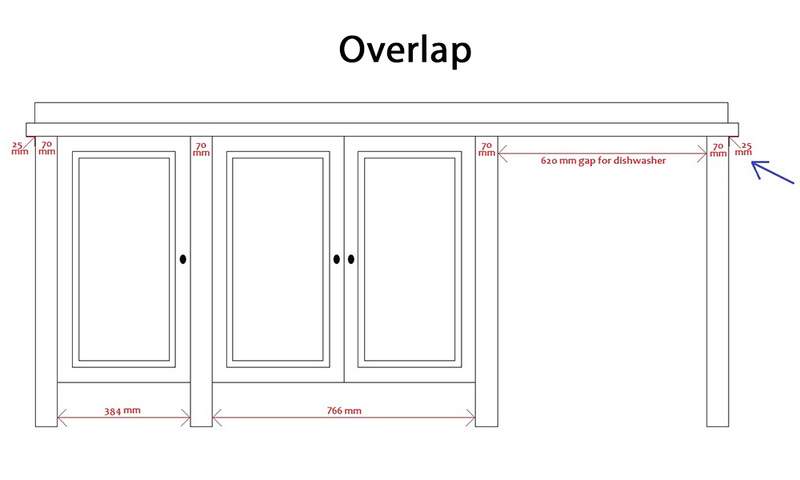 So, remember to add 50mm to the width of the unit so that your top overlaps the way it is intended to. 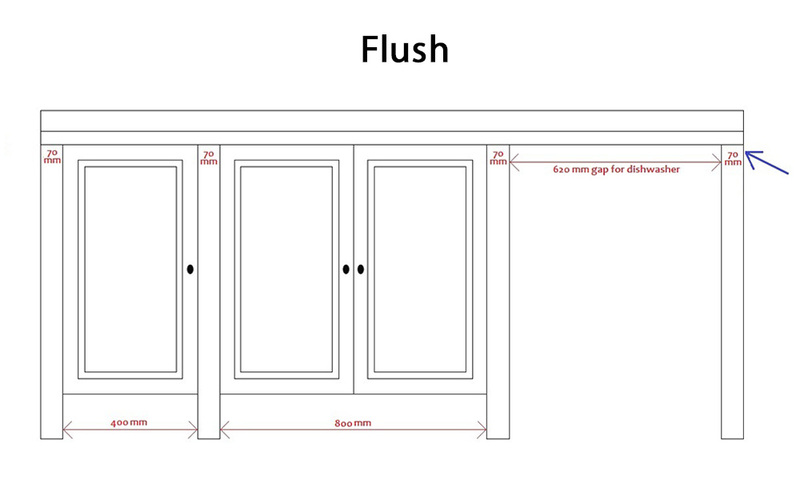 If you order a flush end unit, the 25mm overlap on either side falls away. Tell us which side you would like the flush end to be. It can be flush on both sides. The width is the measurement of the top from left to right. The depth is the measurement of the top from front to back. The top is 40mm thick. The top overlaps the unit in the front by 30mm. The splash back is 100mm high. 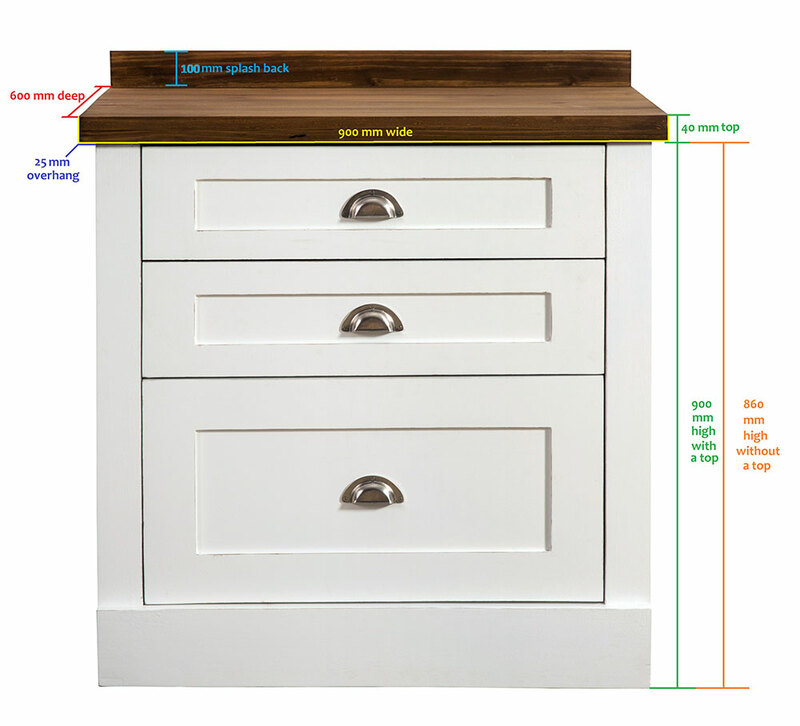 Note the measurements of the corner unit in the diagram. We can customise corner units to suit you. 8. What kind of tops can I get for my kitchen? Contrary to what some expensive, glossy home decor magazines might have you believe, you don’t really need meters and meters of a continuous granite surface to prepare a meal or to have a beautiful kitchen. Have a look at Gallery or our Pinterest page to see the range of possibilities and gain some inspiration. You can choose any tops you like and they don't have to all be the same to look good! Possible tops in order from the cheapest to the most expensive are: Pine, Ash, Granite, Bamboo, Stainless Steel, Quartz and Caesar Stone. Choose the one that suits your budget. Solid wood tops are available from Milestone Kitchens in Pine or Ash. We can work with you to source Granite, Bamboo, Stainless Steel, Quartz or Caesar Stone tops for your kitchen units and fit them for you. 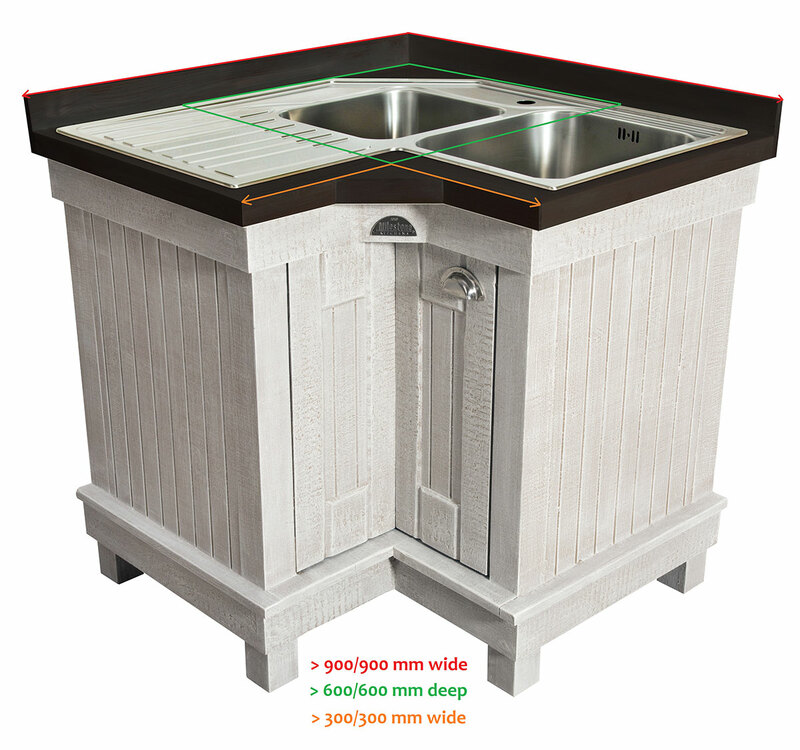 You may also order the units without tops and have your own tops fitted on site. Stainless Steel is more complicated as the steel is wrapped around a wooden support so we order it and fit it in the factory. 9. How can I seal my wooden tops? Sealing your wooden tops is done in your own home once the units are in place. There is a wide variety of sealers that you can use depending on the look you are after. Whether you would like a high gloss, matt or natural finish is completely up to you. Ask your local hardware store what they recommend for the look you want. Many of our clients derive a great deal of satisfaction from sealing their own tops. 10. Can I get doors only? Yes you can. For those of you who would like to give their kitchen a Milestone face lift with minimal cost, all you need to do is replace your doors. We will make them for you in any of our ranges and attach the hinges and handles for you. Send us your door measurements and we will send you a quote. 11. Do you have a showroom? We don’t have a showroom, but we do have a Factory Outlet Shop where you can view some of our products. Look at our Factory Outlet page on our website to find out more about our shop. 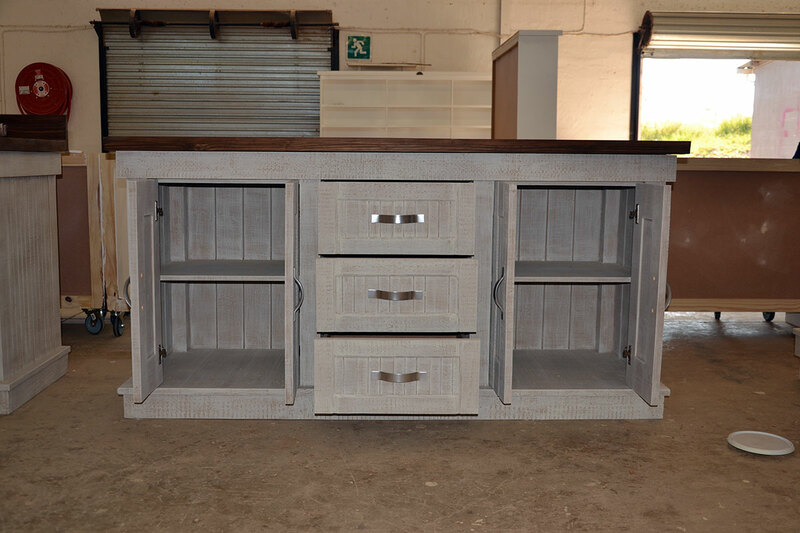 To buy your Milestone Kitchen, you can do so directly from us, online, through our website. Our Factory Outlet Shop in Johannesburg is our only space outside of our factory and office in KwaZulu-Natal. A shop, rather than a showroom, here you can purchase a selection of Milestone Kitchen units, Factory Seconds, Kitchen Smalls and other decor items. 12. What wood do you use? About 80% of our units are made out of solid SA pine. We use supawood in structural places where warping could be a problem, such as the door frames on the larger pieces. We also use supawood for the shelves and the inside of the drawers. In the case of the French Flair range the entire door is made of Supawood. The backing board of the units are made of Supawood. WE NEVER USE CHIPBOARD. 13. How do I install my Milestone Kitchen? You do not need to install your Milestone Kitchen. The people delivering your kitchen units will place the floor units where you want them. The floor units are made with adjustable feet so that uneven floors can be accommodated. Plug in the stove and fridge. Either call a plumber to connect up the plumbing for your Sink Unit or do it yourself. Hang up the wall units using anchor nails, rawl bolts or plugs and screws depending on how big your unit is and how much weight it will carry and then…. your kitchen is good to go. Done. 14. What colours can I use for my kitchen? You may use any colour you want. Using our standard colours won’t cost you anything more. If you choose your own colour, send us the colour swatch code so that we can buy it and apply it to your units. Choosing your own colour will cost you an additional 10%. 15. Please provide more details about the paint finishes. 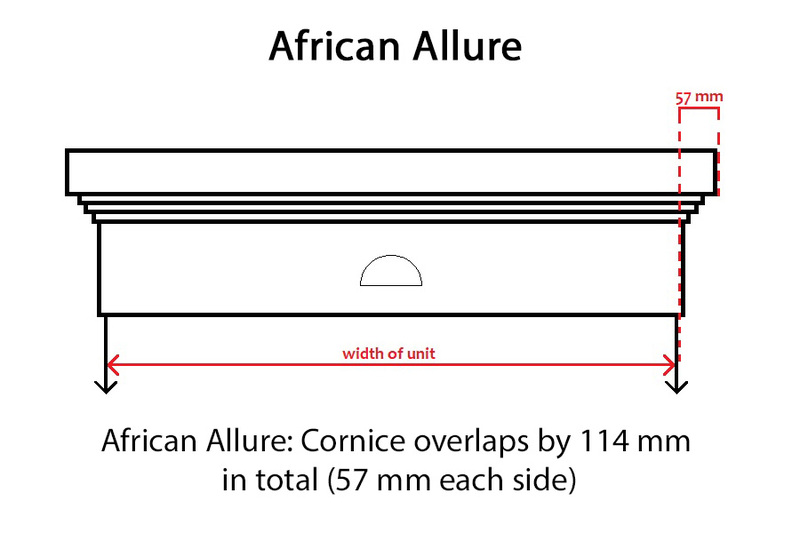 African Allure: These units are not smooth; the wood has a rough sawn textured finish. The African Allure look is achieved by using two different colours. The paint is dry brushed onto the units. This results in a colour that is not uniform or flat. The colour is stoney/grey. The tops are a stained dark brown. 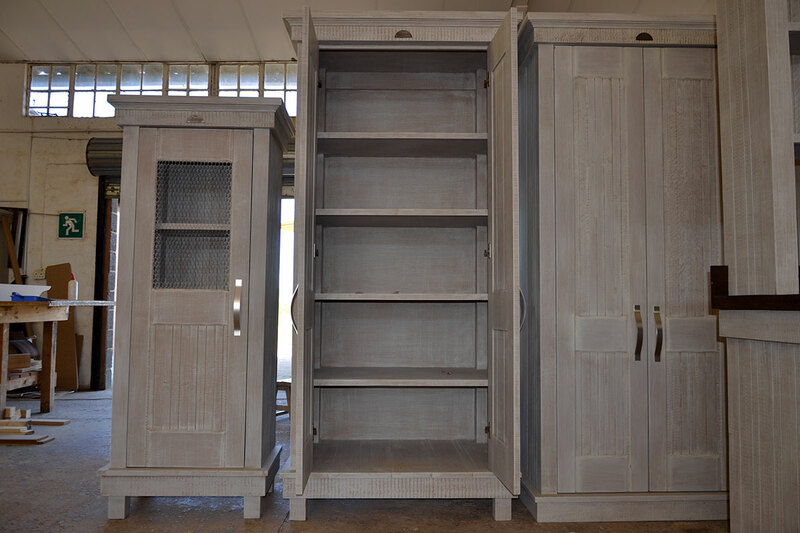 French Flair: These units have a smooth satin finish. The colour is creamy/grey rather than off-white but definitely not yellow. The edges are sanded back a little to reveal a dark stain. The tops are stained medium brown. 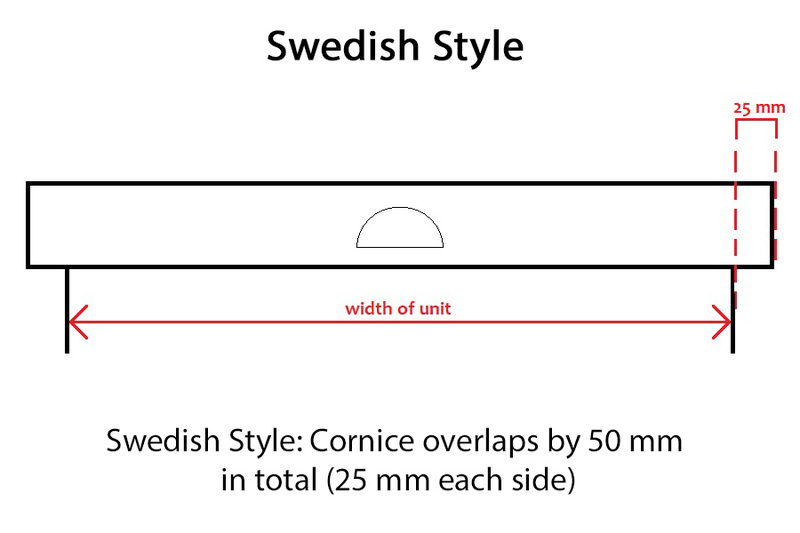 Swedish Style: These units are a smooth matt finish. The colour is more stark white than a soft white but without being harsh on the eye. The edges are sanded back a little to reveal a dark stain. The tops are stained light brown. All the colours are interchangeable between the units. 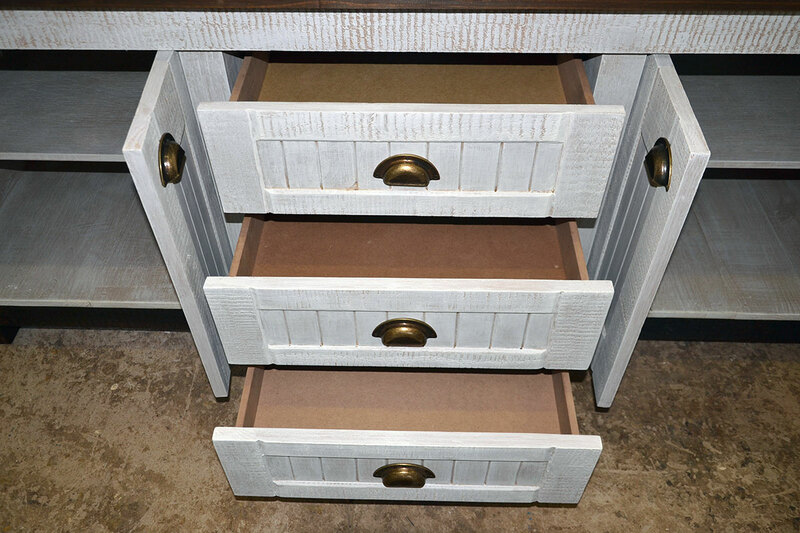 For a more worn shabby look you can ask for extra distressing of your units. You can also ask us to paint your units flat and not sand edges. 16. What kind of paint do you use? We use an expensive furniture grade water based acrylic paint. We don’t use enamel paint because it is glossy and plastic looking and this does not suit our style. The paint we use is fully wipeable so the units are easy to clean with a damp cloth. Your kitchen cupboards will probably require a repaint after a few years. The fact that they are painted with an acrylic paint makes this relatively easy because your units will just need a light sand to prepare the surface for repainting. 17. What does the inside of the units look like? 18. What runners do you use? We use galvanised telescopic runners with ball bearings that can take 45kgs of weight. 19. What hinges do you use? We use galvanised concealed hinges. They are counter sunk and adjustable and guaranteed for 40 000 openings. 20. How do I fit my sink? You have options. You can do it yourself. You can organise a plumber to come do it for you. OR, we can do it for you. If we do it for you here is how you go about it. 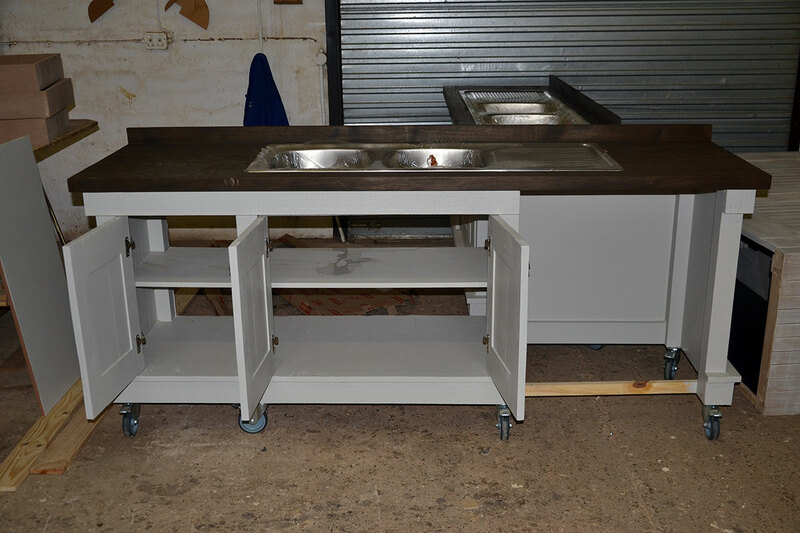 If you have already bought a sink, you can have it delivered to us at Milestone Factory. If you still have to order a sink, you can order it online at On Tap and they will deliver your sink to us at the factory so that we can place it into your unit. It is entirely up to you what type of sink you want in your sink unit. We do offer Single Butler Sink and Double Butler Sink Units. These sinks are ordered by us and fitted at the factory. We will contact you at the beginning of production to ask you exactly where you would like your sink fitted in your sink unit. If you choose to ask Milestone Kitchens to fit your sink, please note that we are not securing or siliconing it into place. This has to be done in-situ by yourself or your plumber. We only cut the hole and place the sink inside the top. The sink will be sent with the unit loose. We do not provide taps. These are organised by you and fitted by yourself or your plumber. If you are putting on stone tops, do not stick the tops to the wall. be moved in the event of a leak. 21. Can I fit my stove/oven/hob into any of the units? Yes, we can custom make any unit to house your stove, oven, eye-level oven or hob. There is no extra charge for this service. Milestone Kitchens has an association with SMEG and we are able to offer the company’s full range of appliances at competitive prices. SMEG will deliver your stove to our factory. Hirsch’s will deliver to Milestone Factory for a fee. 22. How does payment work? Once you have confirmed your order with us and have approved your quotation a 50% deposit is required in order to secure your place on our production roster. You are still able to adjust things on your quotation up until the point that we start production. We will let you know when we are ready to start production and ask if there are any last-minute changes that need to be made. We will send you a final invoice during the week of delivery. Final payment is required before your units leave the factory. 23. Do you have a guarantee? It is highly unlikely that this would ever happen but if for any reason you are not satisfied with your Milestone Kitchen, you may return it within 30 days in the same condition that you received it, for an exchange or full refund, less shipping and handling. Please return your purchase to the Milestone Factory in KZN. 24. Will any of the units require additional work? Units with basins will require plumbing and some might need basic electrical work, but most are free to move as you wish. Wall units are simply attached to the wall in much the same way as a framed picture is. This is the way kitchens used to be, back in the day. 25. Do I have to have castor wheels on my Swedish Style units? No, you can have your units standing on whatever you like be it legs, castors wheels, a plinth or a recessed plinth. 26. What can I do if my corner unit will not fit through my door? We can make your unit with detachable feet. The unit should then fit in sideways. You can put the feet on when the unit is inside the kitchen. 27. Should I put a skirting in my kitchen? Yes. The tops of the units overlap the back of the unit by 10 mm to accommodate a skirting. Polishing your kitchen with successive applications of wax polish is advisable because it gives a layer of protection against moisture, oily deposits, scratches and cracks. Polishing helps to clean away dirt and surface smudges. Polish can also soften and blend in any marks over time and give your kitchen a soft natural glow. The degree to which you polish your kitchen is a personal choice but we advise that the units are polished once every three to six months. We recommend ordinary Cobra Wax Polish or any solvent-based, pure and uncoloured wax polish. Apply a coat of white wax to small areas at a time and polish with a dry clean cloth until it shines. In some cases, especially in hot and humid conditions, the resin does tend to bleed a bit which will look like a yellowish smudge on the unit. If this happens you can correct this by painting successive layers of paint over the bleed until it disappears. Use the touch up paint that we have provided for you. You might have to do this a few times. "I love love each piece you have !!!" Order Your Dream Kitchen Now! "I just want to say thank you, my units arrived today and I am in love with them. Really appreciate the excellent service. Bee is a superstar!"